1 O God, my God art Thou, I seek Thee earnestly, My soul thirsts for Thee, my flesh pines for Thee, In a dry and weary land, without water. 2 So in the sanctuary have I gazed on Thee, To see Thy power and Thy glory. 3 For Thy loving-kindness is better than life, [Therefore] my lips shall praise Thee. 4 So will I bless Thee while I live, In Thy name will I lift my hands. 6 When I remember Thee on my bed, Through the watches [of the night] do I meditate on Thee. 7 For Thou hast been a help for me, And in the shadow of Thy wings will I shout for joy. 8 My soul cleaves [to and presses] after Thee, Me does Thy right hand uphold. 9 But these--for its destruction they seek my soul; They shall go into the undermost parts of the earth. 10 They shall be given over to the power of the sword, The portion of jackals shall they be. 11 But the king shall rejoice in God, Every one that swears by Him shall glory, For the mouth of them that speak a lie shall be stopped. 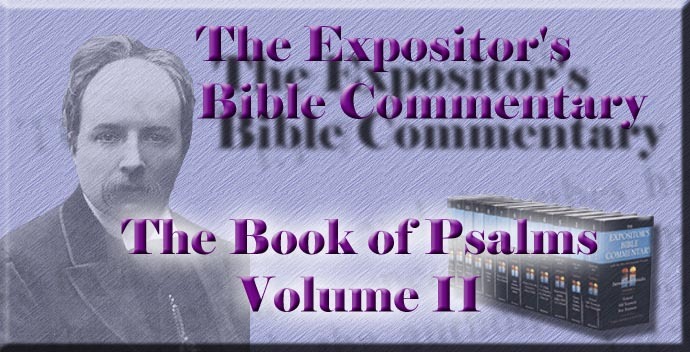 If the psalmist is allowed to speak, he gives many details of his circumstances in his song. He is in a waterless and weary land, excluded from the sanctuary, followed by enemies seeking his life. He expects a fight, in which they are to fall by the sword, and apparently their defeat is to lead to his restoration to his kingdom. These characteristics converge on David. Cheyne has endeavoured to show that they fit the faithful Jews in the Maccabean period, and that the "king" in ver. 2 is "Jonathan or [better] Simon" ("Orig. of Psalt.," 99, and "Aids to Dev. Study of Crit.," 308 seqq.). But unless we are prepared to accept the dictum that "Pre-Jeremian such highly spiritual hymns obviously cannot be" (u.s.), the balance of probability will be heavily in favour of the Davidic origin. The recurrence of the expression "My soul" in vv. 1, 5, 8, suggests the divisions into which the psalm falls. Following that clue, we recognise three parts, in each of which a separate phase of the experience of the soul in its communion with God is presented as realised in sequence by the psalmist. The soul longs and thirsts for God (vv. 1-4). The longing soul is satisfied in God (vv. 5-7). The satisfied soul cleaves to and presses after God (vv. 8-11). These stages melt into each other in the psalm as in experience, but are still discernible. In the first strophe the psalmist gives expression in immortal words to his longing after God. Like many a sad singer before and after him, he finds in the dreary scene around an image of yet drearier experiences within. He sees his own mood reflected in the grey monotony of the sterile desert, stretching waterless on every side, and seamed with cracks, like mouths gaping for the rain that does not come. He is weary and thirsty; but a more agonising craving is in his spirit, and wastes his flesh. As in the kindred Psalms xlii., xliii., his separation from the sanctuary has dimmed his sight of God. He longs for the return of that vision in its former clearness. But even while he thirsts, he in some measure possesses, since his resolve to "seek earnestly" is based on the assurance that God is his God. In the region of the devout life the paradox is true that we long precisely because we have. Every soul is athirst for God; but unless a man can say, "Thou art my God," he knows not how to interpret nor where to slake his thirst, and seeks, not after the living Fountain of waters, but after muddy pools and broken cisterns. Ver. 2 is difficult principally because the reference of the initial "So" is doubtful. By some it is connected with the first clause of ver. 1: "So"--i.e., as my God--"have I seen Thee." Others suppose a comparison to be made between the longing just expressed and former ones, and the sense to be, "With the same eager desire as now I feel in the desert have I gazed in the sanctuary." This seems the better view. Hupfeld proposes to transpose the two clauses, as the A.V. has done in its rendering, and thus gets a smoother run of thought. The immediate object of the psalmist's desire is thus declared to be "to behold Thy power and glory," and the "So" is substantially equivalent to "According as." If we retain the textual order of the clauses, and understand the first as paralleling the psalmist's desert longing with that which he felt in the sanctuary, the second clause will state the aim of the ardent gaze--namely, to "behold Thy power and Thy glory." These attributes were peculiarly manifested amid the imposing sanctities where the light of the Shechinah, which was especially designated as "the Glory," shone above the ark. The first clause of ver. 3 is closely connected with the preceding, and gives the reason for some part of the emotion there expressed, as the introductory "For" shows. But it is a question to which part of the foregoing verses it refers. It is probably best taken as assigning the reason for their main subject--namely, the psalmist's thirst after God. "Where your treasure is, there will your heart be also." Our desires are shaped by our judgments of what is good. The conviction of God's transcendent excellence and absolute sufficiency for all our cravings must precede the direction of these to Him. Unless all enjoyments and possessions, which become ours through our corporeal life, and that life itself, are steadfastly discerned to be but a feather's weight in comparison with the pure gold of God's loving-kindness, we shall not long for it more than for them. The deep desires of this psalmist were occasioned by his seclusion from outward forms of worship, which were to him so intimately related to the inward reality, that he felt farther away from God in the wilderness than when he caught glimpses of His face, through the power and glory which he saw visibly manifested in the sanctuary. But in his isolation he learns to equate his desert yearnings with his sanctuary contemplations, and thus glides from longing to fruition. His devotion, nourished by forms, is seen in the psalm in the very act of passing on to independence of form; and so springs break out for him in the desert. His passion of yearning after God rebukes and shames our faint desires. This man's soul was all on the stretch to grasp and hold God. His very physical frame was affected by his intense longing. If he did not long too much, most men, even those who thirst after God most, long terribly too little. Strong desire has a joy in its very aching; feeble desire only makes men restless and uncomfortable. Nothing can be more preposterous than tepid aspirations after the greatest and only good. To hold as creed that God's loving-kindness is better than life, and to wish a little to possess it, is surely irrational, if anything is so. The remaining clauses of ver. 3 and ver. 4 form a transition to the full consciousness of satisfaction which animates the psalmist in the second part. The resolve to praise, and the assurance that he will have occasion to praise, succeed his longing with startling swiftness. The "So" of ver. 4 seems to be equivalent to "Accordingly"--i.e., since Thy loving-kindness is such supreme good, and is mine because I have desired it. Continual praise and as continual invocation are the fitting employments of those who receive it, and by these alone can their possession of the loving-kindness bestowed be made permanent. If empty palms are not ever lifted towards God, His gifts will not descend. When these are received, they will fall like morning sunbeams on stony and dumb lips, which before were only parted to let out sighs, and will draw forth music of praise. There are longings which never are satisfied; but God lets no soul that thirsts for Him perish for lack of the water of life. Wisdom bids us fix our desires on that Sovereign Good, to long for which is ennobling and blessed, and to possess which is rest and the beginning of heaven. Thus the psalmist passes imperceptibly to the second strophe, in which the longing soul becomes the satisfied soul. The emblem of a feast is naturally suggested by the previous metaphor of thirst. The same conviction, which urged the psalmist forward in his search after God, now assures him of absolute satisfaction in finding Him. Since God's loving-kindness is better than life, the soul that possesses Him can have no unappeased cravings, nor any yet hungry affections or wishes. In the region of communion with God, fruition is contemporaneous with and proportioned to desire. When the rain comes in the desert, what was baked earth is soon rich pasture, and the dry torrent beds, where the white stones glittered ghastly in the sunshine, are musical with rushing streams and fringed with budding oleanders. On that telegraph a message is flashed upwards and an answer speeds downwards, in a moment of time. Many of God's gifts are delayed by Love; but the soul that truly desires Him has never long to wait for a gift that equals its desire. When God is possessed, the soul is satisfied. So entire is the correspondence between wants and gift, that every concavity in us finds, as it were, a convexity to match it in Him. The influx of the great ocean of God fills every curve of the shore to the brim, and the flashing glory of that sunlit sea covers the sands, and brings life where stagnation reigned and rotted. So the satisfied soul lives to praise, as the psalm goes on to vow. Lips that drink such draughts of Loving-kindness will not be slow to tell its sweetness. If we have nothing to say about God's goodness, the probable cause is our want of experience of it. That feast leaves no bitter taste. The remembrance of it is all but as sweet as its enjoyment was. Thus, in ver. 6, the psalmist recounts how, in the silent hours of night, when many joys are seen to be hollow, and conscience wakes to condemn coarse delights, he recalled his blessednesses in God, and, like a ruminant animal, tasted their sweetness a second time. The verse is best regarded as an independent sentence. So blessed was the thought of God, that, if once it rose in his wakeful mind as he lay on his bed, he "meditated" on it all the night. Hasty glances show little of anything great. Nature does not unveil her beauty to a cursory look; much less does God disclose His. If we would feel the majesty of the heavens, we must gaze long and steadfastly into their violet depths. The mention of the "night-watches" is appropriate, if this psalm is David's. He and his band of fugitives had to keep vigilant guard as they lay down shelterless in the desert; but even when thus ringed by possible perils, and listening for the shout of nocturnal assailants, the psalmist could recreate and calm his soul by meditation on God. Nor did his experience of God's sufficiency bring only remembrances; it kindled hopes. "For Thou hast been a help for me; and in the shadow of Thy wings will I shout for joy." Past deliverances minister to present trust and assure of future joy. The prerogative of the soul, blessed in the sense of possessing God, is to discern in all that has been the manifestations of His help, and to anticipate in all that is to come the continuance of the same. Thus the second strophe gathers up the experiences of the satisfied soul as being fruition, praise, sweet lingering memories that fill the night of darkness and fear, and settled trust in the coming of a future which will be of a piece with such a present and past. The third strophe (vv. 8-11) presents a stage in the devout soul's experience which naturally follows the two preceding. Ver. 8 has a beautifully pregnant expression for the attitude of the satisfied soul. Literally rendered, the words run, "cleaves after Thee," thus uniting the ideas of close contact and eager pursuit. Such union, however impossible in the region of lower aims, is the very characteristic of communion with God, in which fruition subsists along with longing, since God is infinite, and the closest approach to and fullest possession of Him are capable of increase. Satisfaction tends to become satiety when that which produces it is a creature whose limits are soon reached; but the cup which God gives to a thirsty soul has no cloying in its sweetness. On the other hand, to seek after Him has no pain nor unrest along with it, since the desire for fuller possession comes from the felt joy of present attainment. Thus, in constant interchange satisfaction and desire beget each other, and each carries with it some trace of the other's blessedness. Another beautiful reciprocity is suggested by the very order of the words in the two clauses of ver. 8. The first ends with "Thee"; the second begins with "Me." The mutual relation of God and the soul is here set forth. He who "cleaves after God" is upheld in his pursuit by God's hand. And not in his pursuit only, but in all his life; for the condition of receiving sustaining help is desire for it, directed to God and verified by conduct. Whoever thus follows hard after God will feel his outstretched, seeking hand inclosed in a strong and loving palm, which will steady him against assaults and protect him in dangers. "No man is able to pluck them out of the Father's hand," if only they do not let it go. It may slip from slack fingers. We descend from the heights of mystic communion in the remainder of the psalm. But in the singer's mind his enemies were God's enemies, and, as ver. 11 shows, were regarded as apostates from God in being traitors to "the king." They did not "swear by Him"--i.e., they did not acknowledge God as God. Therefore, such being their character, the psalmist's confidence that God's right hand upheld him necessarily passes into assurance of their defeat. This is not vindictiveness, but confidence in the sufficiency of God's protection, and is perfectly accordant with the lofty strains of the former part of the psalm. The picture of the fate of the beaten foe is partly drawn from that of Korah and his company. These rebels against God's king shall go, where those rebels against His priest long ago descended. "They shall be poured out upon the hands of the sword," or, more literally still, "They shall pour him out," is a vigorous metaphor, incapable of transference into English, describing how each single enemy is given over helplessly, as water is poured out, to the sword, which is energetically and to our taste violently, conceived of as a person with hands. The meaning is plain--a battle is impending, and the psalmist is sure that his enemies will be slain, and their corpses torn by beasts of prey. How can the "king's" rejoicing in God be the consequence of their slaughter, unless they are rebels? And what connection would the defeat of a rebellion have with the rest of the psalm, unless the singer were himself the king? "This one line devoted to the king is strange," says Cheyne. The strangeness is unaccounted for, but on the supposition that David is the king and singer. If so, it is most natural that his song should end with a note of triumph, and should anticipate the joy of his own heart and the "glorying" of his faithful followers, who had been true to God in being loyal to His anointed.